One day after a mini mutiny broke out at the Venezuela central bank, where some staffers received "early retirement offers" Friday after disregarding orders from upper management and refusing to carry out financial operations that have been barred by US sanctions (although realistically besides printing money do Venezuela central bankers really do all that much), the financial boycott hit Venezuela where it hurts even more: its sovereign bonds, where trading ground to a halt on Monday after the White House updated its sanctions guidelines on transactions tied to Maduro’s regime. Mutual funds and exchange-traded funds that are U.S. persons "may not buy, sell, or otherwise engage in transactions related to debt, equity or other holdings in blocked persons and must block such holdings, unless authorized by OFAC," the Treasury Department advised on its website, even as Treasury officials declined to elaborate on the rule or its implications for traders. As a result, bondholders at nine investment firms and hedge funds from New York, Miami, London and Berlin queried by Bloomberg said that on Monday they stopped trading in Venezuela sovereign bonds and debt from state oil giant PDVSA following the U.S. Treasury Department instructions which were interpreted as barring virtually all transactions. Ironically, the trading freeze comes amid renewed hopes of a regime change which sent the bonds to 1 year highs as investors scrambled to load up. Now they won't be able to sell their exposure for an indefinite period of time. While European and Asian funds weren't subject to the same restrictions, the concentration of debt trading within the U.S. financial system makes it challenging for those firms to buy and sell as well. Many financial institutions, for example, adhere worldwide to U.S. sanctions. Meanwihle, according to Bloomberg, Trace showed zero trades on PDVSA’s debt since last Wednesday although Bloomberg caught a handful of trades in Venezuela's 9.25% bonds due Sept 2017. 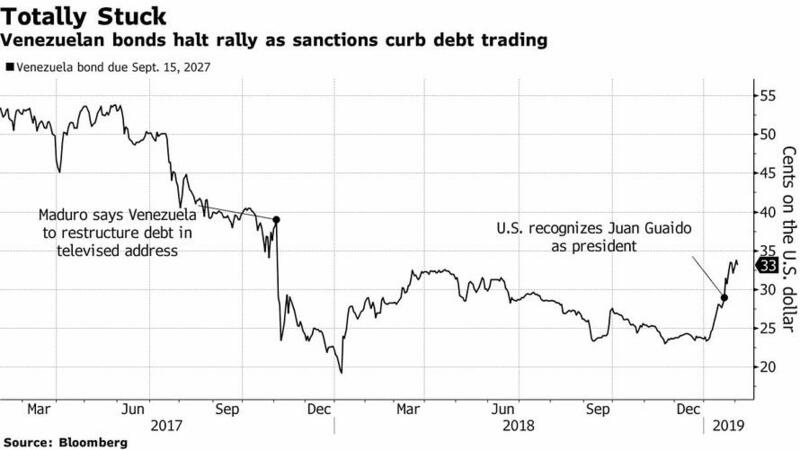 “Legally and theoretically I should be able to trade these bonds, but practically I am not able to do it anymore,” said Lutz Roehmeyer, a Berlin-based money manager at Capitulum Asset Management, which holds PDVSA bonds. Meanwhile, the complicated, lengthy and sometimes contradictory instructions from the Treasury forced investors to seek legal assistance parsing the text word-for-word. "If the Venezuela sanctions aren’t clarified, trading of the debt will be similar to what we had with Cuban debt,” Jean-Dominique Butikofer, of Voya Investment Management told Bloomber. “Everyone will trade with a legal tweezers."